The faith is a Christian faith, but at the same time, it preserves the Lebanese culture that encompasses many kinds of religions. This is important because it widens the horizon in teaching children the truths because the people of Lebanon now have a stigma of wars and conflict. Teaching them that historically, the people of Lebanon are people of peace, love and understanding helps them understand the pride and culture of themselves and others. This is the spiritual and cultural philosophy of Father Toufic Nasr of El Cajon’s St. Ephrem Maronite Catholic Church. After nearly a year in service in El Cajon, he and his parishioners are preparing for the church’s largest celebration of the year, the 10th Annual Lebanese Festival, a festival meant to share the culture of the Lebanese people with the community of all religions and ethnic histories. 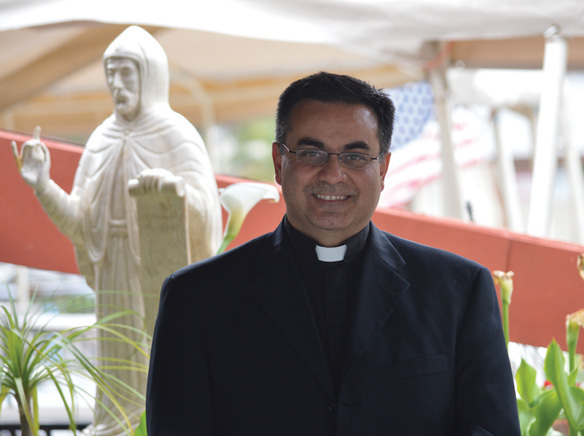 Nasr, born in Beirut, said he came to America in his calling to be a Maronite priest, studying the eastern Catholic religion at a seminary in Washington D.C., being ordained in 1997. His travels took him through Ohio Michigan, the San Francisco bay area and eventually led him to his new home in El Cajon. He said like his church, which is diversified with Lebanese and Iraqi immigrants, understanding and teaching the culture of the people is as important as feeding their spirit. A parishioner in San Antonio that grew up in this country, but his parents were from Lebanon said he envied the tremendous pride in the culture of that gives parishioners from Lebanon the power to be happy and proud of their heritage. Nasr said to him that it is the same for him, because he comes from that culture. Ghada Kadri said what moves her in the people that Nasr connects with is his genuine spirit and approach to people. Nasr said in Lebanon, the U.S. or any country in the world, people can go to their own church and in Lebanon, there are many churches of many faiths. Elie Haddad said St. Ephrem is always inclusive with the community and feels it is important that everyone knows that they are welcome, not only to their annual festival, but to their house of worship. “This church has been open to all, many of the Chaldeans in the community and I think that it is important to the community,” he said. Nasr said the festival is a social event to introduce the community to the Middle East Lebanese traditions, food, dance, music and a fundraiser at the same time. He said it is a great time to meet the community. St. Ephrem’s 10th Annual Lebanese Festival runs from Friday May 24-Sunday May 26. For more information about times, program, food and festivities go to www.lebanesefestivalsandiego.com.